The Volcanoes ended their losing 2017 season with a bang Sunday, ripping the Eugene Emeralds 11-1. Ryan Kirby got his Northwest League-leading 65th run batted in, setting a Volcanoes record in that department. Logan Baldwin won the league batting title at .342, and Bryce Johnson came in second at .329. Peter Lannoo pitched the first six innings and got his first win against three losses. Luis Pino pitched the seventh and eighth and John Timmins the ninth. Rollie Lacy was the loser in relief at 0-2. The game was scoreless through 3-1/2 innings, but Salem-Keizer scored three runs in the fourth. The Volcanoes scored four in the sixth and four in the eighth. Eugene did not get its lone run until the ninth. In the bottom of the fourth, after Lacy took over from starter Keegan Thompson, Kirby led off with a double to right field. Orlando Garcia drove him home with a single to center and moved to third base on a missed-catch error by catcher Michael Cruz. Manuel Geraldo hit a Baltimore chop infield single to score Garcia. Michael Sexton singled to right, sending Geraldo to third. A sacrifice fly to center by Dylan Manwaring scored Geraldo. Casey Ryan took the mound for the Emeralds, and Baldwin hit a one-out single to left. After another out, Baldwin stole second base and went to third on a throwing error by Cruz. Ryan, however, struck out the next batter. In the Volcano sixth, Geraldo led off with an infield single. Sexton struck out, but Juan Rodriguez reached first base on a force attempt, with Geraldo safe at second on a throwing error by Ryan. Manwaring singled to left, scoring Geraldo, with Rodriguez reaching third on a missed-catch error by Cruz. Shane Matheny singled to right, driving in Rodriguez, with Manwaring going to second. Johnson tripled to center, bringing Manwaring and Matheny home. Ricky Tyler Thomas came in to pitch and retired the side. Brian Glowicki went in to pitch the bottom of the eighth, and Manwaring led off with a double to center. Matheny singled to right center, moving Manwaring to third. Johnson singled to center, batting in Manwaring. Matheny went to third, and a throwing error by center fielder Chris Singleton moved Johnson to second. Logan Baldwin doubled down the left field line, scoring Matheny. Kirby grounded out to first base but got Johnson home and Baldwin to third. Garcia scored Baldwin with a sacrifice fly to right. With Timmins facing the Emeralds, Miguel Amaya hit a one-out single to right. Ramsey Romano singled to center, moving Amaya to second. Brandon Hughes singled to left, and Amaya tried to score but was out on a throw from Johnson to catcher Manwaring as Romano reached second. Jose Gonzalez drove in Romano with a single to center. “It just happens that everything clicked,” he said. Lanoo said his season-ending victory came from continuing to work on different pitches. Spokane had two big innings to one for Salem-Keizer, getting a sweep of the five-game series at Volcanoes Stadium. The Indians scored once in the first inning and once in the second before Volcano bats came alive in the bottom of the second with four runs. In the third, the visitors responded with five runs. Three more Spokane runs in the sixth put the game out of reach. In the Volcano second, Rob Calabrese’s two-run double was the biggest blow. Two singles, a walk, and a force out also contributed to the four runs. Spokane’s third-inning rally included a two-run homer by Melvin Novoa and a two-run double by Curtis Terry. In the Indian sixth, Matt Whatley hit a two-run homer. Volcano starter Greg Jacknewitz was the losing pitcher with an 0-2 record. Josh Advocate was the winning pitcher in relief at 1-2. Here was another case of Salem-Keizer barely trailing in hits, 11 to 13, but not putting them together. The Volcanoes scored a run in each of the first two innings for a 2-0 lead before the Emeralds rallied for five in the third. The hosts answered with two in the third to cut the deficit to one run, but the guests scored six times in the seventh and added a run in the eighth. Eugene even made two errors to none for the Volcanoes. However, walks and hit batsmen helped the Emeralds’ cause. 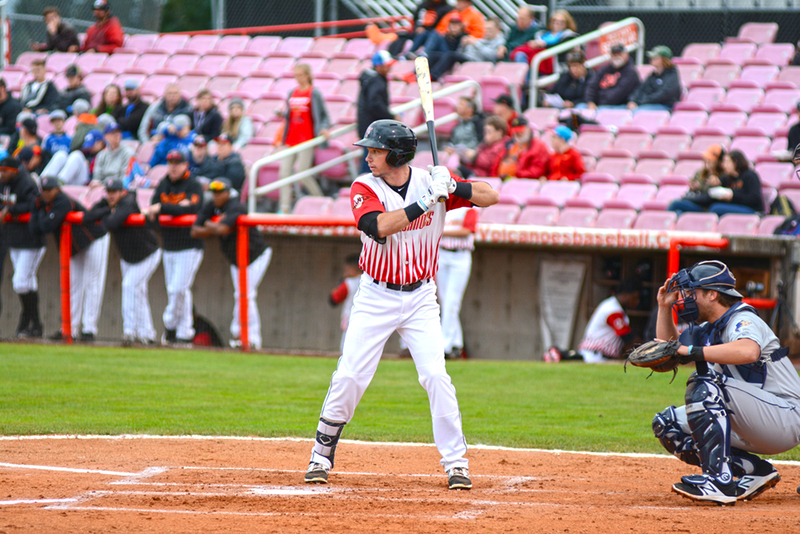 Ryan Kirby had three hits for the Volcanoes, Bryce Johnson and Logan Baldwin two each. Javier Assad started for Eugene and got the win; he is now 5-6. Stet Woods was the losing pitcher in relief with a 3-2 record. This time, Eugene had two very hot bats instead of two very hot innings. Zach Davis and Jared Young each had four hits and scored two runs. Young drove in four runs. Michael Cruz hit a solo homer. Volcano starter Julio Benitez pitched 6-2/3 innings, gave up five runs, four earned, and ran his record to 1-7. Cesar Yanez pitched the rest of the way and allowed three runs. Enrique De Los Rios was the winner in relief at 4-1. Emerald pitchers scattered six hits, including a solo homer by Orlando Garcia.